GOP candidates for Wilmington City Council’s 1st Ward seat, from left, are Jonathan McKay and Matt Swindler. From left, Wilmington Mayor John Stanforth and former city service director Larry Reinsmith participate in a forum. WILMINGTON — Neither of the two Republicans running for mayor of Wilmington lost their temper Tuesday night though there was an exchange of criticisms regarding each other’s past work performance. 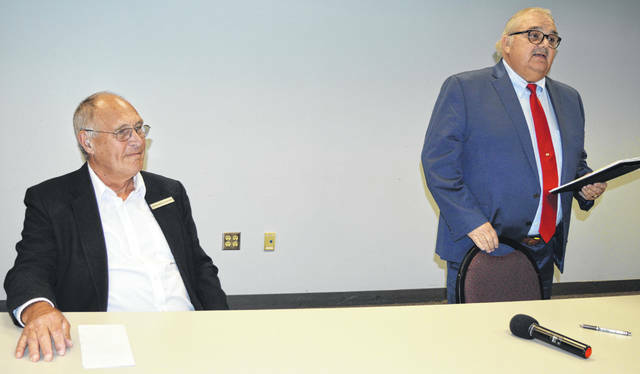 Incumbent Mayor John Stanforth and former city director of public services Larry Reinsmith made critical comments during opening statements at city hall in the community room where seats were at a premium. 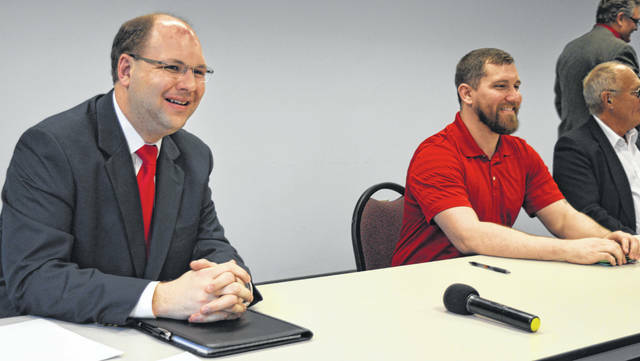 Two GOP candidates for the 1st Ward seat of city council — incumbent Jonathan McKay and challenger Matt Swindler — also took part in the candidate’s forum held seven weeks before the May primary election. After referring to extensive 2018 residential street repaving work and plans to rebuild Rombach Avenue, Stanforth said like all the city’s current projects they are “properly engineered and inspected to avoid mistakes like those made on Davids Drive many years ago” — which occurred while Reinsmith worked for the city, though Stanforth did not specifically say that. Stanforth said the property maintenance code is being enforced for the first time in decades — again not mentioning Reinsmith by name but Reinsmith served as a city building official. Reinsmith, during his opening statement, said the city street department failed to order road salt, and had to borrow salt from the Ohio Department of Transportation (ODOT) one week and from the county the next week. Reinsmith listed a number of severe weather events that occurred this winter, and then added the problem is the mayor was in Florida during all of those events. He said that is the main reason he’s running, that Wilmington needs a mayor who will be here for major emergencies and for simpler problems, too. Stanforth said “it’s rubbish” to suggest that spending a few weeks in Florida every winter with his wife illustrates a half-hearted commitment to serving as mayor. Instead, his commitments to his family and to “effective honest administration of our fair city are entirely compatible,” he said. Regarding road salt, Stanforth said salt had not been an issue. But Reinsmith said ODOT is his source. Reinsmith said calls to city hall offices often end up with an answering machine, and that in-person visitors too often find sticky notes on office doors due to the staff not being there at the time. Stanforth said he is not going to hire “an assistant to an assistant just so an office is always manned.” He added if the Human Resources office is closed for lunch, then another office covers for it. City officials are considering whether to explore a charter form of municipal government. Reinsmith said he would never be in favor of a charter government, and after adding a lot of Democrats would like it, Reinsmith wondered why local Republicans who have such a strong presence in the city and county would want to relinquish that power. Stanforth said if the charter government option is pursued, it will be the citizens who decide, not the mayor or council. One of the louder instances of audience applause occurred when Reinsmith said if he becomes mayor, the hours for the city’s taxi service will be extended. Of the public transit service, Stanforth said the city is so blessed with the system, and that the majority of funds for the taxi service come from the state of Ohio. There was a question about the police department which recently has seen three resignations and moreover, where there are four ongoing investigations into possible criminal charges of former and current staff. Stanforth said because the investigations are ongoing, he cannot say much, adding the probes are taking longer than expected. Reinsmith said given the community’s drug crisis, it is a terrible time to have a depleted police force. One theme Reinsmith spoke of more than once is a need for the city to be more pro-active in creating residential building lots in town. A questioner asked about Wilmington Air Park expansion impacting the community in terms of a potential need to grow city services and infrastructure. Both McKay and his challenger for city council Matt Swindler are sympathetic to expanding the city’s taxi service. In presenting their qualifications, McKay gave a long list of volunteer boards he serves as a member, and Swindler spoke about how valuable his four years in the Marine Corps and two combat tours were in forming work traits. The forum did have a light moment. While standing and making his opening statement, Reinsmith’s pants, perhaps due to a new belt, fell down. The next day, he quipped that he is starting a go-fund-me page to buy suspenders. The candidates forum can be viewed online at http://bit.ly/2HJhU7E . https://www.wnewsj.com/wp-content/uploads/sites/22/2019/03/web1_1st_ward.jpgGOP candidates for Wilmington City Council’s 1st Ward seat, from left, are Jonathan McKay and Matt Swindler. 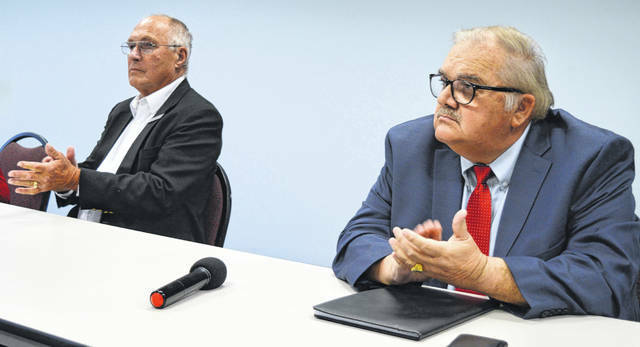 https://www.wnewsj.com/wp-content/uploads/sites/22/2019/03/web1_mayoral.jpgFrom left, Wilmington Mayor John Stanforth and former city service director Larry Reinsmith participate in a forum.